As you noticed we are having a major 90’s flashback in fashion. Plaids, neons, mini skirts, oversized jackets and the biker shorts are everywhere and I as usual, always hesitate to adopt a trend if it doesn’t meet certain criteria. I wasn’t sure that the biker shorts were for me, all I was seeing in stores was the mid- thighs style in Lycra and these are fine for workout or for a relax look with sneakers or flip flops but this material doesn’t look good if you are going for a dressier look. So I decided to wait a little longer, hoping for a brand to read my mind and design something that wouldn’t look like gym clothes to wear them with blazers and sweaters; that was the outfit that I had in mind. Soon enough, thanks to the fashion fairy, we have more options, I found my biker shorts online at missguided.com fast fashion always win! These biker shorts (or cycling shorts) come in gray and black in faux suede, very soft at touch the downside is that they fit large, (I ordered medium) and you want these bad boys tight, not only to hug your curves but also to look like a second skin, therefore having the hems looking loose around your knees is a tremendous faux pas. But how to wear them? this is my first time wearing biker shorts after 20 years so I wanted to take it easy; now I have curves that I didn’t have before and the last thing I want to do is to drag attention to my derrière. 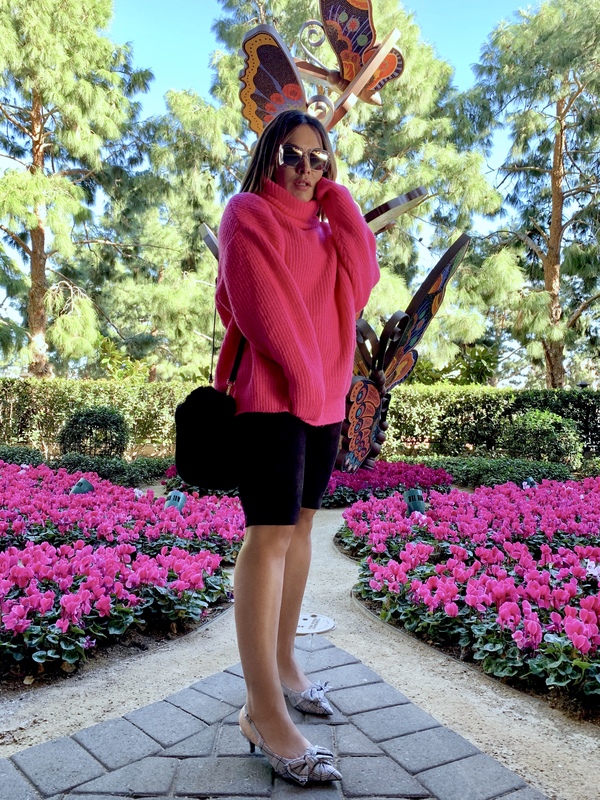 This ZARA knit was the ideal piece to complement my short adventure, long enough to cover my boom boom but super lightweight and soft to move freely. Chucky knits styles are BIG this 2018 fall-winter, you will see a lot of this trend. See my other findings. Last but not least shoes! I don’t what about you, but I’m a big fan of slingbacks! and I think the kitty or even the small block heel are cute and comfy you can wear them to the office, casually for coffee with your friends or to run errands, they add that dressy touch to the simplest outfit. like I said at the beginning Plaids are everything now.